Working in the RV business I see a lot of first-time RV owners who are looking for tips on how to start their RV adventure. There is no doubt that buying a new RV is both very, very exciting but also intimidating at the same time. Here are seven tips for the first-time RVer when heading out for the first time. If you haven’t picked up your rig yet, perhaps you might consider recording the walk-through with the tech at the RV dealership. There are so many things to remember that a video will give you a point of reference to review in the future. Even if you didn’t think to do this, you can find tons of these videos on YouTube so there’s always that. This is literally one of the most important things you can do to prevent hiccups in your adventure. As a newbie on your first journey there are so, so many things to think about when heading out that it’s easy to forget something. Even if you don’t forget anything, it’s frustrating to have your mind whirling with all the possibilities of what can happen and the adventure you’re going to have and then not be able to sleep the night before you depart. Checklists are the best solution for this. We’ve created a great beginning checklist alongside the article Checklists make for StressLess Camping which you can download and modify. From there you’ll refine the checklist so that it suits your particular RV and your style of camping, but having a checklist is always a great idea. 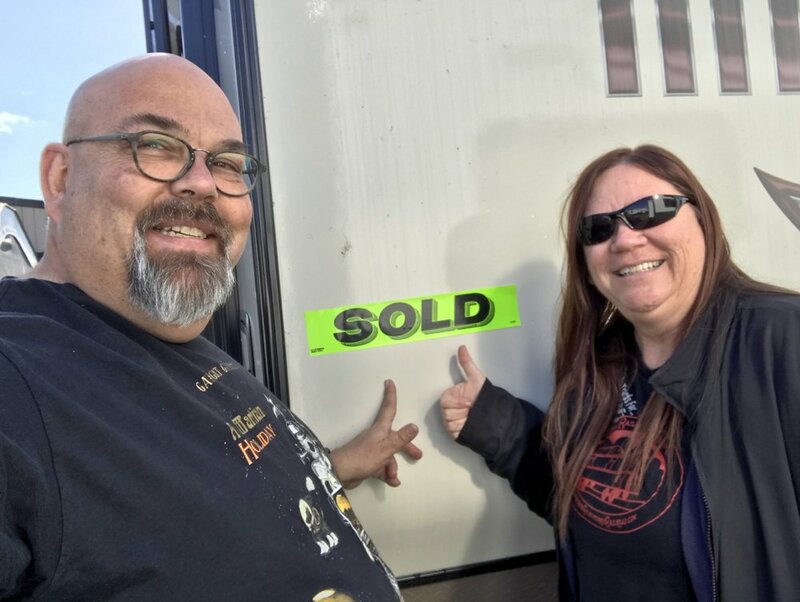 Part of the reason that checklists work so well is that you’ll find that RVers are very, very friendly folks. If this is your first journey into an RV park you’ll find all your neighbors probably want to help you and are excited about getting to know you as well. When it comes time to break camp and head out they’ll also want to talk to you and this is when you can forget something critical. For example, I’ve seen people forget to put in steps or roll in the awning or unplug a hose or electrical connection. A checklist will help avoid forgetting that. For our first journey with Curby we camped at a campground that was both close to home and also close to WalMart. While I’m not a huge fan of Wally World, I do recognize that they have a lot of supplies for RVers. Also, if I forgot a sweater or a pair of shoes, being close to home means it would only mean a short trip to solve this issue. This also let me refine my own checklist and get to the point where I knew what to expect when setting up and tearing down. Running a huge Facebook group for RVers, I’ve read a lot of stories about first-time RVers actually camping in their own driveway. This gives you a total bit of peace of mind as your main supply shed, your home, is just steps away. There are a lot of different ways to communicate with hand signals, not the least of which is the one that people use frequently in LA on the freeways. Oh, I’ve seen couples use that gesture when setting up for the first time alright. But you and your camping partner, if you have one, should work on a series of understandable hand signals that work to communicate what’s going on. While having a backup camera is a good idea, having someone that you can clearly see at the back of the whole rig sharing information with the driver is a really good idea as well. One of the most important things to remember for the signaler is to never, ever get into a place where the driver cannot see that individual. You never want to step behind the vehicle and you always want to remain in sight of the driver and their mirrors. Learn to Back In - it’s easy! One of the skills that people fear the most is backing a trailer but learning to do so is actually pretty easy. Find an empty parking lot such as an abandoned mall or something of that sort and set-up a series of red party cups. Make a fake “campground” outline with the cups and then practice backing in. You can set up several obstacle courses this way. The reason the cups are great is they will cause absolutely zero damage to your coach if you hit them. After a few backing attempts you’ll be an absolute professional with these and, in no time, you won’t have hit any of the cups. Now you’re ready for a real campground. Oh, and don’t forget your backup assistant and their fancy hand signals. There are a few more things to consider. First of all, never ever leave your awning out when your rig is unattended or at night. It doesn’t take much wind to literally rip part of it right off the side of the coach and this is very, very expensive. Plus flying awning arms are highly destructive. By the same token, it may not always be wise to leave pets unattended in the RV, especially at first. Not all are comfortable with the experience and may bark while you’re gone. There’s also the chance that the climate control could fail somehow leaving them either too cold or too hot, depending on the season. If you’re bringing pets, prepare to have them enjoy the whole experience. Know that GPS lies. A lot. That trip that your digital mapping program says is going to take two hours may really take three. Or four. With an RV you’re not likely driving as quickly as the rest of the vehicles plus there’s that desire to stop to see the biggest ball of twine or whatever other roadside attraction you just can’t pass up. Look at the campground and roads you’ll be taking before getting there with something like Google Earth or Apple Maps. Keep an eye peeled for things like low bridges, narrow roads and other obstacles or hazards. Nowadays we’re pretty fortunate that we can inspect roads before we ever head down them. Lastly, check out our article on RV Essentials. Having the right gear can also make for StressLess Camping. Oh, and chill. You’ll get through this and have stories to laugh about in the future. And you’re on vacation - enjoy it! One of the things that excites me about future journeys is using my computer’s browser to bookmark places that I’d like to go. When I hear about other’s journeys to places that might appeal to me, I’ll bookmark it in my browser. That way I have a bunch of great places saved up. You can do essentially the same with Pinterest.